DOC NYC has announced the exciting news that the 2018 Doc NYC documentary festival will host the world premiere of The Orange Years: The Nickelodeon Story, a brand-new fan-made documentary that takes a look at how Nickelodeon has become the number-one network for kids', on Thursday 15th November 2018 at 7:00pm at the SVA Theatre! Using their combined skills in journalism and filmmaking as well as their mutual love for classic Nickelodeon, directors Adam Sweeney (part of the team behind The Prequels Strike Back: A Fan's Journey) and Scott Barber set out to make the documentary film Nickelodeon fans deserve. The childhood friends from The Woodlands grew up watching their beloved shows together and now share a new perspective on Nickelodeon. The Orange Years journeys behind the scenes of the “kids first” phenomenal programming to chronicle the improbable and unprecedented success of Nickelodeon, straight from the mouths of those who brought the classic shows to fans as children. Filled with interviews from the actors, writers, animators, and creators from all your favorite golden age Nick shows, the film highlights the work of visionary Geraldine Laybourne, who was largely responsible for the network’s success in the early days. Update (5/11): The upcoming Nickelodeon documentary titled The Orange Years will be holding its world premiere at DOC NYC on November 15, and to celebrate, ComingSoon.net has unveiled an awesome sneak-peek clip! Learn about how cult classic series The Adventures of Pete & Pete scored such great musical guest stars as Michael Stipe, Iggy Pop, Debbie Harry, David Johanesen and Gordon Gano in the player below! 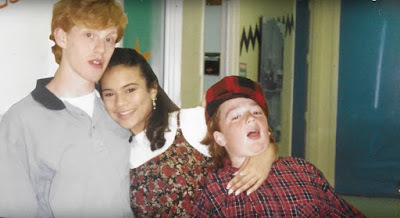 The Adventures of Pete & Pete star Danny Temberelli features in this clip, as he explains how series director Katherine Dieckmann had previously worked on the music videos “Shiny Happy People” and “Stand” for the band REM. That’s how they landed the band’s frontman Michael Stipe for a guest role, and that opened the door to have all sorts of cool guest stars. The documentary has been been a labor of love for the filmmakers, who have interviewed some of the most famous and recognizable names from the channel's history, all the way back to its unlikely origins in Columbus, Ohio. Marc Summers (Double Dare), Larisa Oleynik (The Secret World of Alex Mack), Phil Moore (Nick Arcade), Kirk Fogg (Legends of the Hidden Temple), Venus DeMilo (Salute Your Shorts), Michael Bower (Salute Your Shorts), and Danny Cooksey (Salute Your Shorts), Fred Keller (Hey Dude) and Christine McGlade (You Can’t Do That on Television). Not that The Orange Years concentrates only on Nick's live-action output. The filmmakers also talked to talents from the groundbreaking animated division, like writer Mitchell Kriegman (Rugrats, Clarissa Explains it All), and the king of cartoon voice work, Tom Kenny (Rocko's Modern Life and SpongeBob SquarePants). More than just a history lesson or a “where are they now?” special, the documentary explores the network’s revolutionary approach to storytelling, the impact it had on a generation of youth, and aims to find out of why these shows have stayed in the hearts of so many people. The The Orange Years screening at the ninth annual DOC NYC festival will be attended by directors Scott Barber and Adam Sweeney; and '90s Nickelodeon stars Danny Tambarelli and Michael C. Maronna from The Adventures of Pete & Pete. Lee Leshen will serve as the panels moderator. WORLD PREMIERE You Can’t Do That on Television, Clarissa Explains It All, Double Dare, The Adventures of Pete & Pete, Doug, Rugrats… If you recognize any of these titles, you probably grew up watching Nickelodeon, the cable-television network devoted to kids that launched almost 40 years ago. Beginning as a small local channel, visionary leadership led to its rapid growth into a global phenomenon. The Orange Years is a nostalgic and entertaining look back at the early years of the youth-oriented network that broke all the rules to let kids enjoy being kids. Beck said he prepared for writing the score to The Orange Years by watching old Nickelodeon shows. In the entire history of musical expression, from the first repeated notes uttered by a caveman to whatever Brock Lesnar puts on to start his day, I truly believe that there is nothing more thrilling, more elating, more capable of generating pure excitement than the opening theme to Nickelodeon’s Double Dare. Just hearing it in my head makes me feel like I took a garbage bag full of Halloween candy, soaked it in espresso, ground that up with a bucket of Adderall, infused that powdered insanity with the most sativa-heavy dab in existence, and then huffed as big a glob as I could manage through the tailpipe of a monster truck. The Double Dare theme is that exciting, because Double Dare was that exciting. And for my money, that show is the most Nickelodeon of Nickelodeon shows: built on fun, snark, slime, slips, falls, and the disembodied voice of a guy named Harvey, all of it bursting with Nickelodeon’s Memphis Design-inspired ’80s visual pop. Double Dare was like getting hit in the face with a water balloon full of Jolt cola, and Nickelodeon was the cool older cousin who threw it. And like that cool older cousin is in real life, the network is currently in its early 40s. It is finally getting the documentary treatment in the form of a retrospective called The Orange Years, debuting in select theaters in the mid-November. The doc’s director, Scott Barber, had done some voice work at FUNimation, the Flower Mound-based anime studio famous for hits like Yu Yu Hakasho and Cowboy Bebop, and he mentioned his upcoming Nickelodeon retrospective to ADR director Tyler Walker,because he needed someone to write the film’s score. Walker suggested the director reach out to a local musician who may seem like an unlikely composer for such a project, Pinkish Black frontman Daron Beck. Though making original music to match Nickelodeon’s characteristic wackiness is not the sort of sound Beck normally dabbles in, he was stoked for the gig and the compositional challenges it presented. Beck said his favorite Nickelodeon era was the network’s early ’80s programming block –– shows like Pinwheel, Today’s Special, and You Can’t Do that on Television. Other than some soundtrack work at FUNimation for Dragon Ball Z, The Orange Years is Beck’s first legit soundtrack job. He said that Barber is in the midst of pitching another project to producers. What that could be is left to one’s imagination – his main musical endeavor, Pinkish Black, is a dark, moody contrast to Nickelodeon’s orange-hued exuberance, but he also said that his dream soundtrack work would be to rescore Pee Wee’s Playhouse. His score for The Orange Years will be a testament to his versatility as a composer, matching Double Dare and Nickelodeon’s other classics note for hyperactive note. Wherefore art thou, Stick Stickley? If you grew up in the ’90s, chances are you spent way too much of your childhood glued to the TV watching Nickelodeon. The network made a name for itself with off-kilter animated series like Ren & Stimpy and Rugrats, while creating a world of content for kids that included classic shows like Clarissa Explains It All, Salute Your Shorts, and You Can’t Do That on Television. Now, you can relive all that ’90s Nick nostalgia in a new documentary called The Orange Years, which follows Nickelodeon’s humble origins as Qube in Columbus, Ohio, before it became the kids’ programming juggernaut it is today. The film features interviews with former executives, creators, and stars, including Melissa Joan Hart (Clarissa Explains It All), Kenan Thompson (Kenan and Kel), Larisa Oleynik (The Secret World of Alex Mack), and Danny Cooksey (Salute Your Shorts). That handmade, off-the-wall quality endeared the world of Nickelodeon to its audiences, who were looking for something less sanitized or polished than what the Disney Channel was offering. Nickelodeon was not afraid to get gross, whether through dumping green slime on its actors or hosting game shows where kids had to fish around inside a giant snot-filled nose for clues—ah, Double Dare, the American Ninja Warrior of our youth. What do you think of The Orange Years trailer, and what was your favorite ’90s Nick show? More Nick: DK Partners with Nickelodeon to Release Two Adult Humour Titles Inspired by 'Rugrats' and 'Hey Arnold!'! Originally published: Tuesday, October 16, 2018. H/T: Film Pulse; Additional sources: Hello Woodlands, The Austin Chronicle, /Film, Collider. Follow NickALive! on Twitter, Tumblr, Google+, via RSS, on Instagram, and/or Facebook for the latest Nickelodeon and The Amanda Show News and Highlights!